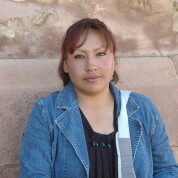 Lucinda is an Indigenous teacher who works in La Paz. She became interested in equal opportunities education after witnessing discrimination against female students in Student Centre elections. Lucinda organised and led a series of projects to give women more of a voice and defend their rights. She united female teachers within the district in support of this mission, and together they designed a set of educational modules and produced booklets, theatre plays, radio broadcasts and videos to raise awareness across the whole community. These materials were then published as a book and presented at the Global Indigenous Women’s Conference in 2013. During the project they rediscovered the role of women in the Andean ‘cosmovision’ and ancient customs of respect for women. As a result of these iniatives, attitudes in the community towards women in general and Aymara women in particular have been changing, and female adolescents are better informed, especially with regard to their reproductive rights. Lucinda’s school has therefore found a new position within the community, especially with the creation of the ‘Centre for the Promotion of Aymara Women’. Join the #TeachersMatter movement by sharing Lucinda Choque’s update.